Cloverdale is strategically located at the I-70 and US 231 interchange (Exit 41) halfway between Indianapolis and the Illinois state line. With a 2010 population of 2,172, the community offers a wide variety of housing opportunities, a top notch school district, and easy access to the recreational activities at Cagles Mill Lake – Lieber State Recreation Area and the nearby Deer Creek Fish and Wildlife Area. 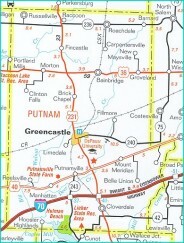 Ten miles north, Greencastle, the county seat of Putnam County, is a college community of 10,300 people. As the home of DePauw University, the community and the entire county enjoy a wide range of cultural and educational opportunities. Putnam County and its smaller communities such as Cloverdale retain their small town rural atmosphere while being only 35 minutes from the Indianapolis International Airport and 50 minutes from downtown Indianapolis. The county’s strategic location also allows it to take advantage of the resources of Purdue University, Indiana University, Rose Hulman Institute of Technology, and Indiana University – Purdue University at Indianapolis (IUPUI). Cloverdale and all of Putnam County are served by a new Ivy Tech Community College campus located in Greencastle. With support from throughout the county, the new campus opened its doors in the Fall of 2009. The campus offers a wide range of educational and workforce training opportunities. Endeavor Communications, headquartered in Cloverdale, offers high speed, fiber based, telecommunications services. With its attractive rural location, easy access to Indianapolis, DePauw University, and a new Ivy Tech campus, Putnam County has continued to experience population growth. The county population has increased to nearly 38,000 in 2012. The Cloverdale Community School District serves the community of Cloverdale and Cloverdale Township in southern Putnam County. The district also serves Harrison, Jackson, Jennings, and Taylor Townships in northern Owen County.